Still razor sharp after two tough races, as indicated by his :59 4/5 drill. It is those two stiff races that gives him the slight edge over Union Rags, and the fact that he has a bit more upside when it comes to getting the 1 ¼ miles. He could have been more professional in the stretch of the San Felipe, but we attribute that to the whip. We’d like to see Rosario put it away in the Santa Anita Derby and see what happens. He didn’t need it last year, and he doesn’t need any aggressive encouragement next time out, just a good solid effort to get him to Kentucky. Breezed a half in :49, but flew home in :11 1/5, blowing by his two workmates, and was a pole in front going into the turn. He would seem to need a fairly stiff race, but Matz obviously doesn’t want him freaking either. He’s doing everything the right way. As dominating as he was against News Pending and Discreet Dancer in the Fountain of Youth, he should be tested by El Padrino, and the feeling here is that he’s going to need that test. Take Charge Indy and News Pending aren’t going to be waving any white flags either. He’s still the solid Derby favorite and has shown enough so far to indicate he could be on the road to greatness. Let’s give credit to Pletcher and the Let’s Go Stable team for not being afraid to take on Union Rags now when they could have returned to Fair Grounds for the Louisiana Derby. Might as well find out how he stacks up now, as Union Rags should only get better after this race. El Padrino is a hard-running colt who will stay the distance and isn’t going to back down under fire, as he showed in the Risen Star. With Union Rags coming off only one easy win this year, this actually may be the perfect time for a tenacious, seasoned horse like El Padrino to test him. Pletcher was happy with his final work, a half-mile breeze in :49. Breezed 5 furlongs in 1:01 1/5, and is doing so well in Kentucky he’s going to stay home and return to the Polytrack in the Blue Grass Stakes instead of heading back to New York for the Wood Memorial as originally planned. The owner cites the safety factor in not having to travel and running on a kinder surface. We can’t recall more alterations in horses’ schedules than this year, as we’ve been bombarded with last-minute changes of plans. That’s not to say this isn’t a good idea. Polytrack has proven to be a decent springboard to the Derby, with two of the last five Derby winners having prepped over it. What is important for Hansen is to show again he can rate off the pace and come home strong. I can’t pinpoint why I have such high regard for this colt, especially considering I questioned his skipping the San Felipe. But I love the way he’s been training, with that brilliant 6-furlong work between races followed by one-mile and 7-furlong works. The 7-furlong work in 1:26 1/5 seemed perfect; not too fast and not too slow. O’Neill is putting a lot of conditioning in him and air in his lungs, while trying to prevent him from peaking in the Santa Anita Derby following a two-month layoff. If he succeeds and I’ll Have Another is right there against Creative Cause and possibly Bodemeister, then he’ll have a tough horse on the first Saturday in May. I could be wrong about him, especially considering the Lewis form hasn’t held up, but I just have a feeling this is a much better horse than most people think, and he could be a huge Future Wager overlay at 22-1. This is another colt who has been targeted for several different races and hasn’t run in any of them yet. He was given a stakes pass when an allowance race was carded for him, had a stroll in the park, and now needs a good stiff race to prepare him for the Derby off two starts. He, like Alpha, appears to be heading to the Wood Memorial against a large field, and another easy race is the last thing he needs. He is undefeated, he has the pedigree to run all day, and he has two victories at Churchill Downs. That is a dream resume. More importantly, from a physical and performance standpoint, he has made a great transition from 2 to 3. Like with Super Saver, a little R&R on the farm seems to have done wonders for him. 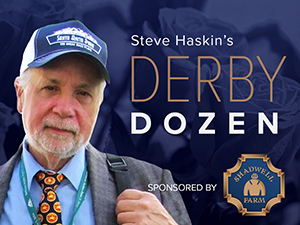 Have to plead guilty for rooting for a son of Tiznow to win the Derby. Lowered him a little only because it’s so tight and at this point he will be the last of the major contenders to compete, along with Hansen. He’s the other horse I’d love to have in the Future Wager (at 26-1), because I find him so intriguing. I loved his second-place finish in the Palm Beach as much as any prep I’ve seen, even if it was on the grass. I can’t help but picture him flying late in the Derby. Although a non-threatening fourth, his race in the BC Juvenile ranked right up there with the top 3, as he turned a horrible trip into an excellent performance. Come Derby week, I expect him to be back in the top 5. Breezed a sharp 5 furlongs in 1:00 4/5. Although we’ve had Steinbeck’s “Travels with Charley,” he goes down as the animal who has had the most interesting journey ever without having gone anywhere. At this point, it looks like he’s finally going to wind up in New York for the Wood Memorial. The bottom line is this is a legitimate Derby contender who is just itching to prove it. He appears to have the talent to take on anybody, and it’s not imperative that he win his final Derby prep, especially after a two-month layoff. He just needs to get in a starting gate, anywhere, and then get down to the serious business of preparing for the Derby. He has the tools, he has the trainer, and he has the pedigree. You can’t ask for much more. He moves up in stature after his bizarre work at Santa Anita that looked more like the chariot race from “The Ten Commandments.” That had to be the wildest free-for-all ever and he came through it like a champ, working in :46 4/5 for the half-mile. I don’t know if any horse has ever gotten a better learning experience out of a work, as he had to negotiate his way through a 10-horse cavalry charge, constantly getting dirt kicked in his face, and not only emerged unscathed, he turned in the second-fastest work at the distance. He still has a lot of history to overcome, but as we well know, times are changing, and he seems to have as much raw ability as anyone. He just needs to catch up in a hurry and keep a straighter course than he did in the San Felipe. Our best wishes to Baffert for a speedy recovery. Jones has him razor sharp with a bullet :59 2/5 work. When the smoke clears, he should be a solid favorite in the Louisiana Derby, and is going to be awfully tough if he runs back to the Risen Star. We’ll find out if he’s a star in the making. Sometimes, it’s that second two-turn race that tells more about a horse with his kind of brilliance. They either move forward off the first one or they fail to duplicate it. Breezed 5 furlongs in 1:01 3/5 for likely start in the Santa Anita Derby. Thought Baffert might send him out of town after last two, but he’s listed as a probable starter. Still can’t help but think we’re going to see big improvement, but the Santa Anita Derby looks like a very tough place to do it. Basically, just looking for a clean trip and a strong finish. He certainly doesn’t need to win, but must at least be competitive with this group, so he can build off it and move forward in the Derby. If not here, the Arkansas Derby or even the Wood look like enticing spots to get him back on track. Although he hasn’t been beating the best of fields he has won back-to-back graded stakes and has demonstrated that all-important desire to win. In his last two starts, he did beat good horses who finished far ahead of the third-place horse, which is something I love to see. Isn’t He clever, previously unbeaten at Sunland, beat the third horse by 7 ¼ lengths. If Union Rags makes it to the Derby, he’s going to lose Leparoux, who has ridden him in his last eight starts and they’re just now getting in sync with each other. The Sunland Derby was set up perfectly for him, but he did come home his last eighth in :12 flat. He’s getting sneaky-good right now. Tough decision between him and Daddy Nose Best for No. 12 spot. Team Valor has been waiting for this kind of breakout race from him for a couple of months and has felt this was their Derby horse ever since he arrived from Europe. There is no doubting their ability to find good horses…anywhere. Big question now is whether to run him again before the Derby. Immediately after the race, owner and trainer seemed to have different thoughts on the matter. Although his race in the Spiral was impressive, and he demonstrated a very efficient stride, it wasn’t as eye-catching or professional as Animal Kingdom’s win last year and he could still use some fine tuning for the Derby. His closing fractions of :25 4/5 and :13 1/5 were just OK, and the first three finishers had never run in a stakes, so we really don’t know the true quality of the field. Most of all, however, loved the way he handled traffic, surrounded by horses a good deal of the trip, and never flinched. European background might have helped in that regard. Good chance he’ll jump into the Top 12 after next week’s races. Yes, the pace was slow. Yes, it was only a maiden race. And, yes, the competition was far from strong. But there was something about his scintillating victory from a visual standpoint that caught the eye. His final half in :46 1/5 and final quarter in :22 4/5 didn’t hurt, nor did his powerful gallop-out, in which he opened 15 lengths in a flash. But most of all it was the way he was striding out in the final sixteenth that suggested this might be a pretty special colt. The Santa Anita Derby is an ambitious spot for his next start, especially with the top-class field being assembled and the fact he’ll probably need to win to assure a starting berth in the Kentucky Derby. But all that aside, we’re still going to pay close attention to him just to see what we’re dealing with. This colt could be Pletcher’s best kept secret, and even coming off a maiden victory he may be ready for a bust-out performance in the Louisiana Derby. Although his pedigree is geared more toward speed than stamina, he was very impressive winning his last race at 1 1/16 miles after being forced 6-wide going into the first turn and still drew off to a 2 ½-length victory, coming home in a solid :24 3/5 and :06 2/5. He’ll go into the race off a visually impressive 1:01 3/5 breeze. Returned to the work tab with a sharp five-furlong drill in 1:00 3/5 in preparation for the Wood Memorial. The only two horses who have finished in front him this year have been Hansen and Algorithms, and he has a license to improve big-time going 1 1/8 miles. Even with Gemologist and Alpha in the Wood, he’s going to be very dangerous. He definitely is one of our main sleepers and will climb up the list in the upcoming weeks as the Wood gets closer. I’m going to hold off until the Arkansas Derby, as there is a major question about the 3-year-old form at Oaklawn this year, especially with the failure of Castaway in the Sunland Derby. Unless there are some high-profile shippers for the Arkansas Derby, the race could come up a bit soft and turn out to be a rematch between this horse and Secret Circle. Baffert and Pletcher are so deep, this would seem like a good spot to try to land some huge graded earnings and grade I status. As for this colt, I’ve been a fan since last fall and would love to see him get Lukas back to the Derby. He just needs to put two good races in a row to be considered a serious contender. Looking for another big effort in the Arkansas Derby. Again, we need to see him take another step forward stretching out to 1 1/8 miles. He’s another horse who wants to win and that’s a trait that will always make him dangerous on the Derby trail, as long as he can prove his ability to get nine furlongs. At this point, it would seem logical to ship him back to Oaklawn for the Arkansas Derby after his two stakes victories over the track. Breezed five furlongs in 1:02 4/5 for the Florida Derby, which will be his make or break race, as it will Take Charge Indy. He just has to figure out what his best running style is and stay consistent with it, Right now we don’t know how he wants to run. We do know he has a big kick and can use it anywhere on the track. It would seem the later the better if he’s going to have any chance to pick up a big chunk of the purse on Saturday. His connections have to decide whether to go in the Wood Memorial or Arkansas Derby. The latter would seem a logical spot for the reasons listed above, but the Wood would give him an extra week to the Derby. This is a consistent, hard-trying colt who just has to prove he can handle better horses than he was facing at Tampa Bay. His owner, John Oxley, did use the Wood as a springboard to a Derby victory with Monarchos. Breezed five furlongs in 1:01 2/5 for his all-important engagement in the Florida Derby, where, like News Pending, he needs to pick up enough graded earnings to move into the Derby picture. He is another whose best running style is still unknown. He also has a big move in him, but needs to time it right. Even with missing the Tampa Derby, a big effort by him on Saturday would not come as a surprise, and you can be sure, with his pedigree, his bandwagon will fill up quickly. Others to keep an eye on this weekend are Cigar Street, a 13 ¼-length maiden winner last time out, who steps way up in company in the Louisiana Derby; California invader Rousing Sermon, who should appreciate the long Fair Grounds stretch and the switch to Mike Smith. Has to overcome the 12 post, but could be a smart play in here; the consistent Z Dager, who needs just a little more rocket fuel in the stretch; the late-running Shared Property, who has a good effort in him anytime he gets the right scenario; Finnegan’s Wake, an improving Dale Romans colt who was third in the Gotham; and Well Armed’s brother Arm Force, who was impressive last time out. Others to watch are Street Life, who should be the big buzz horse in the Wood Memorial after his two electrifying stretch runs. The big issue with him is maturity; Sabercat, who is eligible to improve big-time off the Rebel; still haven’t given up on him; Howe Great, who will have his hands full in the Blue Grass; Najjaar, who will relish the extra distance in the Arkansas Derby; Tampa Bay Derby runner-up Golden Ticket; Our Entourage, who likely will head to the Illinois Derby in an effort to get owner Mike Repole back to Churchill Downs; Private Terms winner Raconteur, who should be heard from more prominently later on; Sam F. Davis winner Battle Hardened, who needs to rebound off a disappointing effort in the Tampa Bay Derby; Jake Mo, a consistent closer who finished a solid fourth in the Rebel; the four-time stakes-placed Senor Rain, who beat a strong field in a seven-furlong allowance/optional claimer at Santa Anita; Stat, another Pletcher latecomer who was brilliant winning a one-mile allowance/optional claimer; and the enigmatic Drill, who stretches back out in the Blue Grass Stakes.